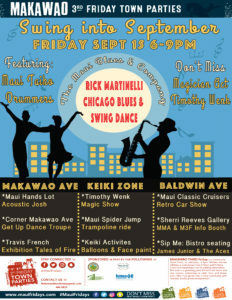 Makawao 3rd Friday Town Party returns this Friday, Aug. 17, 2018 with the theme Dancing the Night Away from 6:00 p.m. to 9:00 p.m. in Historic Makawao Town. This event features fun for the whole family including live music, local shopping, delicious food, arts and crafts and keiki activities. Admission is free. This week’s festivities include Maui’s fun dance band Luna Overdrive on the Makawao Main Stage and world class fire staff dancers Travis French and Nicole Casper performing Tales of Fire in front of the mainstage at band break at around 7:15 p.m. Maui Fridays favorite Get Up and Dance, a Maui line dance group will have you dancing like nobody’s watching at the top of Baldwin Avenue. At the Komoda Bakery Keiki Zone, world-class magician Timothy Wenk will perform and Melissa Buck of Rainbow Art will her creative offer face painting. Dining options include many award-winning Makawao restaurants or food trucks at the pop-up food court along Baldwin Avenue. 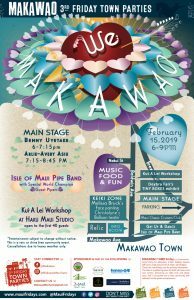 Lots of new vendors are joining the Makawao 3rd Friday ‘ohana, adding a variety of great eats and treats. 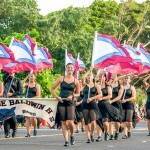 For more details, go to http://mauifridays.com/makawao/.